Las Vegas was a city I was longing to visit for a long time. Though not a gambler nor a person who enjoys “night life”, I was somehow mesmerised with the city. An opportunity to visit it came in the form of Official duty as a participant for “CES – Consumer Electronics Show” in the beginning of this year. The days were busy as I was completely occupied with CES. But outside CES timings, I managed to visit few places in Las Vegas and this post is about it. Las Vegas is famous for its casinos and hotels. In fact, 17 of the 20 biggest hotels in US are located in Las Vegas. I visited few of them like MGM Grand, Bellagio, Caesar’s Palace, Paris and Stratosphere!! Most of them look similar and all of them are grand. It is difficult to find way through them without the help of sign boards!! Apart from Casinos, I was also interested in their restaurants. Most of these hotels are situated in Las Vegas strip area. The fountains in front of Bellagio is a treat to watch. A must visit in Las vegas. The fountain show starts at 3PM and repeats very 30 minutes. Best time to watch the fountains is after sunset when the lights galore the Las Vegas city. 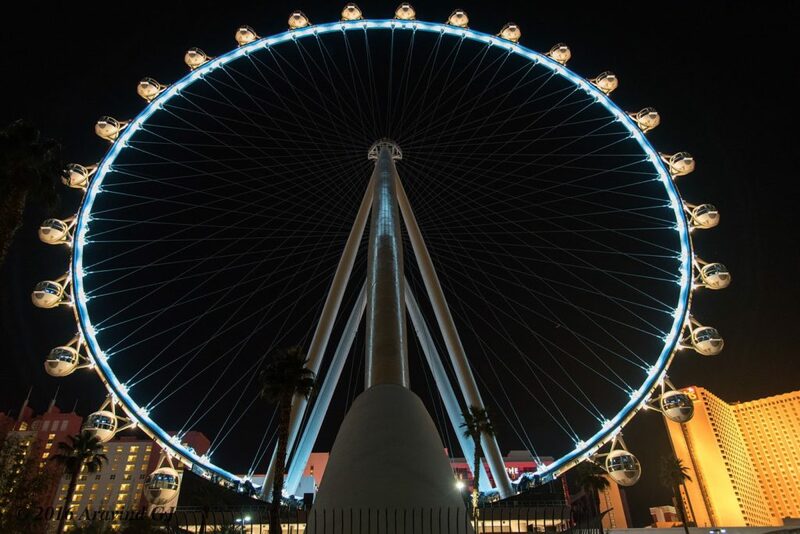 While London eye and Singapore flyer are very famous ferris wheels, the tallest one is in Las vegas. Apart from Giant wheels in Indian fairs, I had never climbed a taller one and hence decided to experience it. The ride lasts for 30 minutes and is fully worth the high price paid (37 $) for this high roller!! It gives a birds eye view of the Las Vegas strip and its skyline. Situated at the north of Las Vegas strip is the largest observation tower in US, Stratosphere. It provides the 360 degrees view of las Vegas city and its surroundings. Is there anything else apart from Casinos to see in Las Vegas? Absolutely yes. Hoover Dam is about 30 minutes drive from Las Vegas. Red Rock canyon is another interesting place nearby. Due to time constraints, I could not visit them. The famous “Grand Canyon” is about 4 hours drive. It can also be reached by helicopter in 30 minutes. “What happens here stays here” is a famous tagline created by Las Vegas tourism department!! Great views! World Famous Gold and Silver Pawn Shop is there in Vegas. If you happen to watch History TV18, Pawn Stars @ 10 PM, you would know what I am saying. Or have you visited by any chance? No. I did not visit that shop.